Delivering information which is technically complex but vital for understanding critical, strategic markets. PMI Media produces a range of database, hard-copy and web-based products for the global aerospace industries. A new 280-page PMI-Media report “Brexit: Threats and opportunities to the UK’s aerospace industry” will provide the first authoritative guide on the impact of Brexit to UK companies across all tiers of the supply chain. The implications of the EU referendum vote have yet to be fully understood and will have many different impacts – positive and negative - to UK aerospace companies, depending on their product and programme portfolios. This study will take in the views of all key players – from EU-based programme managers to UK and EU government experts, trade association representatives, financial and industry consultants, social partners and manufacturing companies themselves – to build a comprehensive picture of the threats and opportunities awaiting the UK’s aerospace industry as a result of the referendum decision. Part one: A strategic overview of the UK’s aerospace business and the potential impact of Brexit. • Supply chain issues: relationship with primes, niche supply chain areas, non-EU competitors and customers. 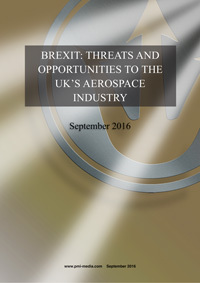 • The impact of Brexit on aerospace relationships with customers and suppliers in north America, China, the Middle East, Latin America, the Far East and Russia. This analysis will be broken down into the following markets: airliners, business aircraft, engines, general aviation aircraft, drones and missiles, military aircraft (manned), rotorcaft, spacecraft, MRO and support companies. 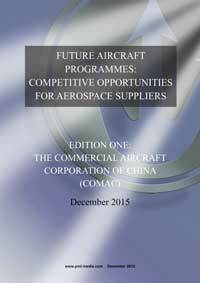 It will provide a future programme guide of the announced and potential launch dates for future platforms, aircraft and engines, and the key considerations for EU company involvement. It will also examine, tier by tier, the competitive landscape to the UK supply chain, highlighting where competitors will seek to take advantage of UK companies no longer trading within the EU. It will provide a broad competitor analysis, highlighting where EU-based companies could gain a competitive advantage, including competitors in north America, the Far East, the Middle East and elsewhere. We will conduct a series of interviews with key decision makers throughout the supply chain, from major integrators to tier three and four companies, to understand their views on how relationships and business with UK aerospace companies will change as a result of Brexit. We will also examine how aerospace companies in Norway and Switzerland have both benefited and faced obstacles as a result of being outside the EU. * The UK’s aerospace industry – turnover, areas of expertise, regional clusters (from the Midlands, Northern Ireland, Scotland, the South East, the South West, the North West, Wales), relationship with government, key programmes. * The global aerospace industry – how the UK sits within the global aerospace industry ; the key relationships, trends in supply chain awards. • Timing. The report will be published at a time when key industry decision makers will have had time to gauge the impact of Brexit on their organisations and formulate plans to exploit new opportunities and manage potential problems. • Access. We will be conducting a wide range of interviews with companies and organisations throughout the supply chain both in the UK and on continental Europe. Our analysis will be based on real-world experiences and views rather than high level trend identification. We have long standing relationships with major integrators and institutions based within the EU. As events and markets evolve we will report on how the relationships, business opportunities and programme decision-making will continue to change the marketplace in our November 2016 and March 2017 updates. • Experience. Since 2004, PMI Media has built up a comprehensive picture of the global aerospace supply chain through its reports, services and customised consultancy work for a wide range of customers. PMI Media is uniquely placed to undertake this study. Since 2004 the company has provided customers around the world with information on aerospace supply chain trends, through its Aviation Supply Chain Intelligence service. It provides an expert, independent view of changing relationships within the global aerospace supply chain, building up relationships with the key players in the process. It also has a strong base in European Union aerospace institutions. It will be available from 26th September 2016 with two updates – November 2016 and March 2017. This is the first in a series of market analysis reports looking at the programme development plans of every major airliner manufacturer, identifying opportunities in the supply chain for aerospace systems manufacturers worldwide. It takes a sector by sector view (structures, electrical systems, fuel system, avionics, air conditioning and cabin pressurisation, landing gear, engines) and examines the key systems and components performance challenges, strategic customer/supplier relationships and other competitive issues which will determine the market opportunities, drivers and obstacles to major contract awards. Other reports in this series include Airbus, Boeing, Bombardier and Embraer. COMAC has announced its intentions of launching a twin-aisle airliner for entry into service in the middle years of the next decade (2020-2030). • Other competitive issues – such as in-service support, transfer of technology, price. This is the only comprehensive guide to future supply chain opportunities. This is more than the traditional type of production forecast available from other publishers. This service has been designed and created by PMI Media’s aerospace team to leverage its successful Aviation Supply Chain Intelligence Service (AvSCI) and provide users with essential, comprehensive and accurate analysis of supply chain issues as new programmes progress. Purchasers will receive two updates to the initial report within 12 months as progress on the aircraft plans evolve. Priced at £295/$475 per report. For all five reports the annual cost is £1,200/$1,900. All reports include two updates within the annual term of the subscription. “The market for ATM equipment and services in India 2015-2019” is a 185 page detailed study of the near future demand for ATM systems in India. This report has been compiled to assist companies and organisations wishing to access the air traffic management market in India. • Provides forecast growth analysis for airport and en-route services. The 185 page report concludes that the market for ATM equipment and services in India will be worth $1.28 billion between 2015 and 2019. The market in India is being driven by three main factors: requirements to supply 50 new low-cost airports with navigation, communication and surveillance equipment; the equipping of new consolidated en-route centres and the introduction of next-generation systems such as ADS-B and precision satellite-based navigation concepts. The report analyses India’s current and strategic ATM development plans and “bottom-up” airport construction projects where new ATM systems will be needed. One of our most recent reports, published in November 2013, examines the shape, extent and dimension of the re-emergent VLJ market. This is the fifth edition of VLJ market reports published by PMI Media and analyses, in particular, the impact of new models recently entering or about to enter the market, addressing the following questions: Does this signify a new era – one in which the operation of personal jets will become a reality for thousands of private pilots? Or will the economic and regulatory hurdles that exist prove to be too much for a genuine new market to emerge? Is the air taxi market about to re-launch as economic conditions improve in Europe and North America? What will be the impact of the liberalising of personal and corporate jet ownership in the Middle East and Asia? How will Cessna and Embraer respond to developing competition? And – finally – what is the market really worth?